Hello again! Katie from Blueprint Modern here with another edition of "Wrapped Up." Spring means new life outside and often refreshing the inside. I have several friends buying new homes this season and so I started brainstorming original housewarming gifts. Below are some of my favorites; some are inspired by gifts I have received like a sweet sketch of my new home or a guest book and some are simply things I have found and know I would enjoy or appreciate in a new place. Do you have a go-to gift to give a friend in a new home? What are your favorites? Gorgeous ideas...love the monogrammed cocktail napkins, who wouldn't love to receive those! So many of these work as hostess gifts too, which I think are the hardest thing to buy! Thanks for sharing. 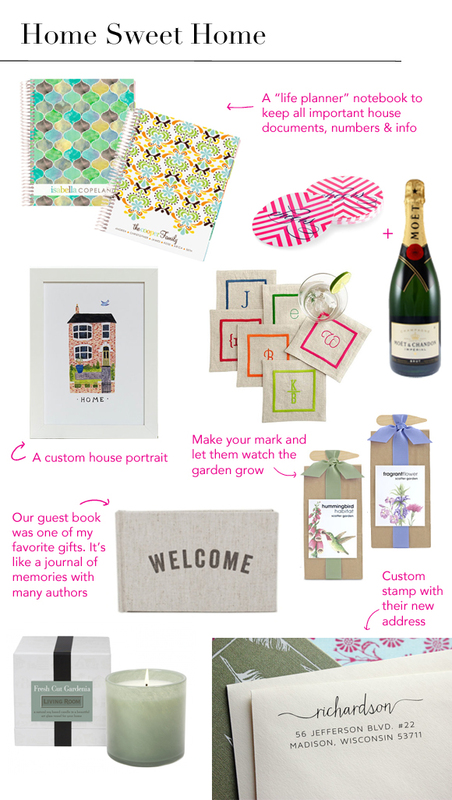 The custom house print is such a cute idea!! I want to do this for my house project.